We've got an immense amount of glitter on the list this week. Don't forget to vote for your favorites in the comments below! 10. The Belgian king and queen welcomed the German president and his partner for a state visit this week. On Tuesday, Queen Mathilde wore a pair of dangling earrings with round pearls to a center in Brussels devoted to finding missing children. 9. The Dutch are back from their annual ski trip, and Queen Maxima wore exaggerated jewelry to attend a health care seminar on Monday. 8. Maxima wore gray pearl jewelry, including the family's lovely gray pearl and diamond stem brooch, to mark the tenth anniversary of a Dutch orchestra on Wednesday. The brooch came into the Dutch collection during the reign of the king's great-grandmother, Queen Wilhelmina. 7. The Duchess of Cornwall wore her paired clover brooches at a reception at Clarence House on Wednesday for the Women of the World Festival. 6. On Tuesday, Queen Elizabeth II of the United Kingdom wore one of her most important heirloom jewels, the Albert Brooch, to mark the 40th anniversary of the Prince's Trust. 5. At Tuesday night's gala in Oslo, Crown Princess Mette-Marit of Norway wore her wedding tiara with an intriguing jeweled bracelet. 4. 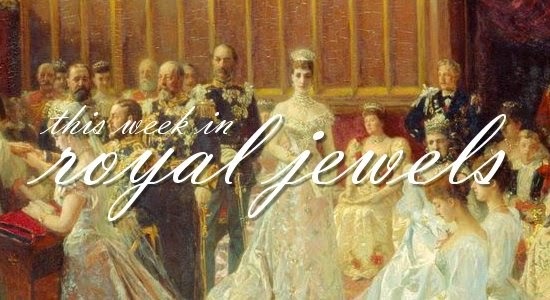 Also visible in the photo above: Princess Astrid of Norway attended the gala wearing the set of turquoise jewelry that once belonged to her great-grandmother, Queen Alexandra of the United Kingdom. 3. Queen Sonja wore the full replica of Queen Maud's Pearl Tiara at the gala, along with a pearl necklace and the Drapers' Company Brooch. 2. At the German state banquet on Tuesday, Queen Mathilde donned her laurel wreath tiara -- but as the piece sat much lower on her head than usual, I have a feeling there's been some sort of change to the frame. She paired the tiara with the white and yellow diamond earrings that were a gift from her husband, King Philippe. 1. The biggest tiara surprise -- and my top spot of the week -- came courtesy of Princess Astrid of Belgium, who borrowed her mother's art deco bandeau for the German banquet. To my knowledge, this is the first time she has worn the tiara in public. I love a tiara debut!